Reflecting on Mirrors: How Do Mirrors ‘Work’? Have you ever gazed into a mirror and wondered just how that reflection is created? If you’ve ever thought about the different types of glass that are used to make windows and mirrors, and the science behind creating reflective glass, Affordable Glass & Mirror is here today to explain the science. To create a mirror, the first thing needed is a smooth, flat surface. A smooth surface is best because it has the most reflective power. As Explain that Stuff notes, when light hits a mirror, it bounces off in the opposite direction at the same angle. If a mirror is curved, either concave or convex, the image that you see in the reflection will be distorted. For a good example, think about looking at your reflection in the back of a spoon. When light comes from the sun’s rays to the surface of the Earth, we don’t see it until it crashes into something and is scattered into particles that we interpret as light. When light hits a mirror, it’s not scattered, but instead reflected back. But, as you may have thought when thinking about the spoon, you don’t need just a smooth, flat glass to create a mirror – you also need some metal. DKfindout! says window glass can only reflect about 80 percent of the light that hits it. That’s why if you happen to catch your reflection in the car window as you get in, it’s not as clear as it is in the mirror. By comparison, mirrors reflect about 95 percent of light. That’s because glass used in mirrors is coated in a layer of silver or aluminum, and backed with a dark material to protect the metal. This means that when light travels through the glass and hits the metal, the electrons of the metal absorb the light and return back light in the same way to get rid of the extra energy, as Explain that Stuff outlines. This is what causes a reflection of the light and energy that hit the mirror to appear. In essence, the light reflected from your clothing and skin is taken in by the metal of the mirror and returned to you as your reflection. Mirrors are wonderful elements, whether as a fixture in your bedroom or bathroom that helps you get ready for the day or as decoration in a hallway or room of your home. At Glass Repair Atlanta, we have years of experience creating, repairing and installing mirrors in Atlanta and the surrounding areas of Georgia. 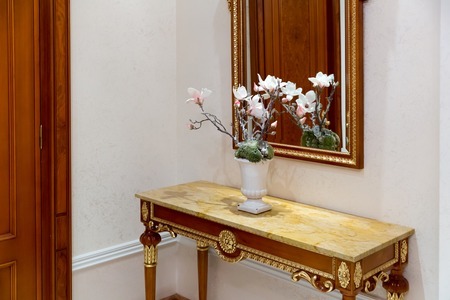 Our mirror and glass replacement services have helped countless home and business owners, and we can work with you to create or replace unique mirrors for full mirrored walls, cut-to-fit picture frames, vanity hanging mirrors and standard or custom bathroom mirrors. Learn more by calling us today at 404-361-5151.